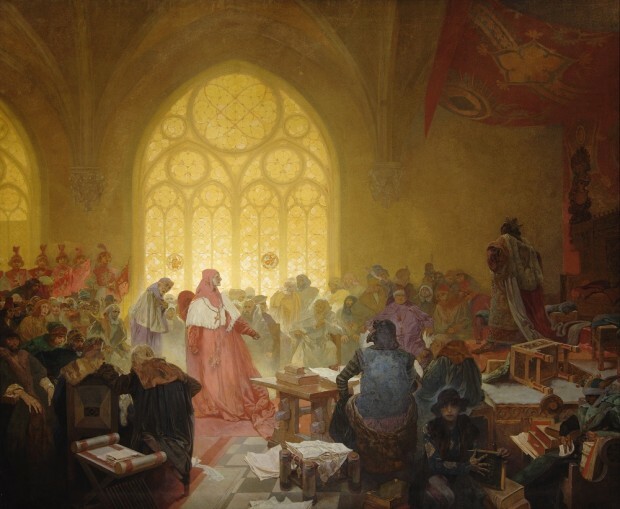 By the 1430s, Rome was forced to acknowledge the strength and determination of the Hussites and officially recognise the beliefs of the Utraquist Church in a treaty called the Basel Compacts. In 1458 Bohemia elected its first native Czech king in around 150 years, Jiří z Podĕbrad, who became an extremely popular ruler. In 1462, King Jiří sent a delegation to Rome to confirm his election and the religious privileges that had been granted to the Utraquist Church in the Basel Compacts. Not only did Pope Pius II refuse to recognise the treaty; he sent one of his cardinals back to Prague to order Jiří z Podĕbrad to ban the Utraquist Church and return the kingdom of Bohemia to the rule of Rome. In this painting, Mucha depicts Cardinal Fantin’s visit to Prague and his ensuing confrontation with King Jiři. Cardinal Fantin stands arrogantly in red robes as the king kicks over his throne in anger and defiance. His refusal to acknowledge the papal authority is met by awe and astonishment among the members of his court. A young boy in the foreground closes a book entitled Roma, indicating that the period of cooperation with Rome has come to an end.